It’s a bit cheeky calling them that, but I’m giving a little nod to the thousands of non-Christians in the UK, who also like to celebrate the midwinter festival. My recipe is inspired by Middle Eastern flavours such as saffron, raisins, sour cherries and barberries. 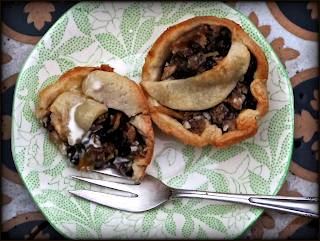 In fact the mince pie was ‘invented’ by crusaders coming back, laden with Middle Eastern ingredients, from the holy lands. Another thing: in this recipe there is no suet (yucky stuff) so they are good for vegetarians too. I put a crescent moon on top, to represent Islam. Islam, strangely, considering some of the oppressive attitudes to women, is a very feminine religion. It follows the lunar calendar rather than our solar calendar. Much of the architecture is also feminine, think of the Taj Mahal, a monument to a woman, and the way that all the beauty and secrets of a typically Islamic building are hidden, with the emphasis on the interior as well as the exterior (the courtyards, the mihrabs or niches, domes and cupolas, all reflect the female form). In art history, the moon, darkness and the left hand side, is considered sinister (la sinistra is Italian for left) and therefore feminine. We are also suspicious of the number 13 in our culture, possibly because it is associated once more with the feminine, with witchcraft, with scary female power: there are 13 moons in a year. 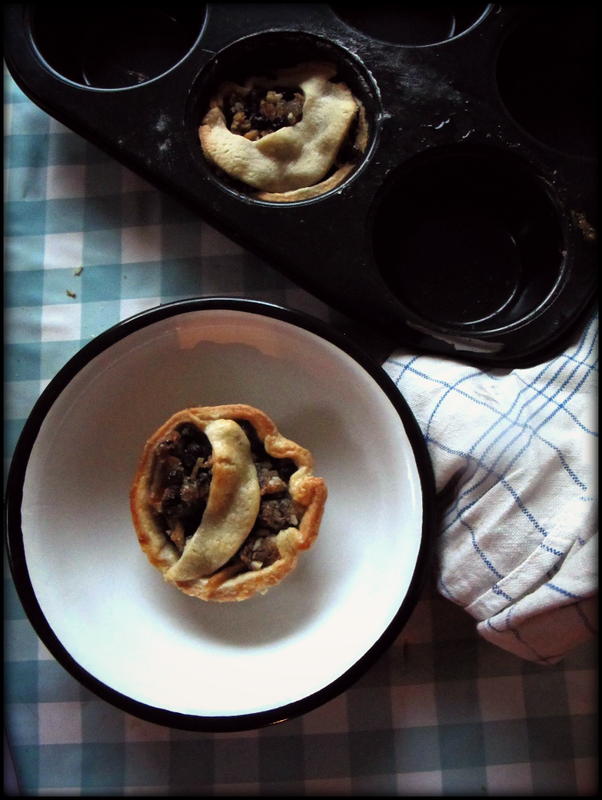 Until recently I never liked mince pies until I started making them myself. This has become my philosophy about food: stuff I think I don’t like is transformed and refreshed when home-made. You can mix and match your mincemeat recipe; although getting the ingredients below will give it an unusual Middle Eastern influence, also feel free to just shove in whatever is lurking in your cupboard, dried fruit wise. The saffron is pretty fabulous as a flavour, both musky and floral, ( I find I’m putting saffron into everything at the moment), and adding some sour fruit also prevents it from being too heavy and sweet. Any leftovers just keep in a jar in the fridge for the next batch. Sieve flour and salt together. Using your fingertips, rub the butter into the flour until it forms a ball, adding a little water as you go. Roll out the pastry onto a surface sprinkled with icing sugar. Roll it thinly and evenly and cut out 12 circles with a cutter or a glass. Mix the mince filling together in a bowl. You can grind the saffron together with a little sugar in a mortar and pestle and add it to the bowl. 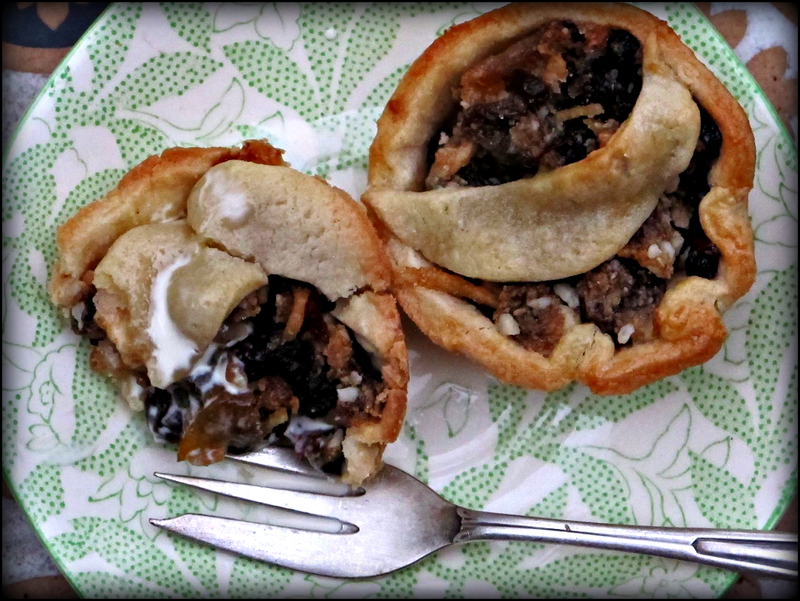 Then add a generous spoonful of mincemeat to each pie ‘hole’. Then cut out a shape, it could be a crescent moon which you can do with a round cutter or a glass, placing it on the edge of one of your already cut out circles for instance. Or use any cutter you like the look of, or just cover with another circle of pastry, making a little nick in the middle for steam to escape. Stick this top on with water or milk using a pastry brush. Bake for 15- 20 minutes in the baking oven of the Aga or at 200ºC in a normal oven. A tip i got years ago for 'normal' mince pies – mix up a little cream cheese with the juice of an orange and put a blub under the pastry cap – melts into the filling but leaves a nice fresher orange note too.